Hawaii, R.M.S. 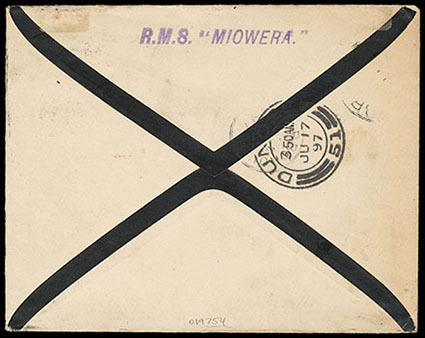 "Miowera", purple straightline backstamp on mourning envelope bearing 5¢ rose lake (76) tied by "Honolulu. 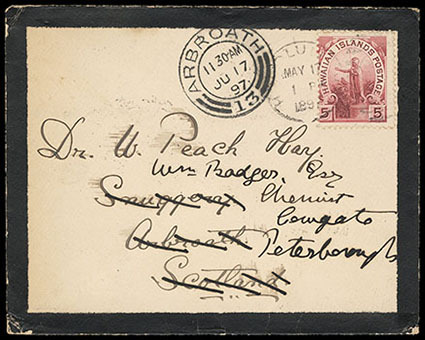 H.I., May 17, 1897" duplex to Scotland, forwarded to Peterborough upon arrival, bold Abroath (6.17) arrival cds; some edge wear and slight toning, otherwise Very Fine and scarce mourning cover use from Hawaii. Hawaii, Stmr. C.R. 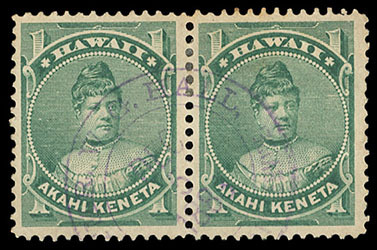 Bishop, Hawaiian Mail Service, Jun 13, 1885, clear strike of purple cds (Davey 361, 1RR) on 1¢ green (42), fresh and Very Fine. Gregory No. AUXSH-I-I (Bishop) Estimate $300 - 400. Hawaii, Stmr. 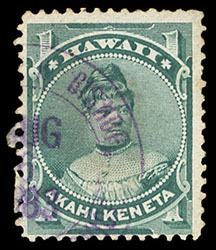 Iwalani, Hawaiian Mail Service, Apr 13, clear partial strike of blue cds (Davey 362, 1R) on 2¢ lilac rose (38), wide margins, Very Fine and scarce. Gregory No. AUXSH-I-I (Iwalani) Estimate $300 - 400. Hawaii, Stmr. W.G. 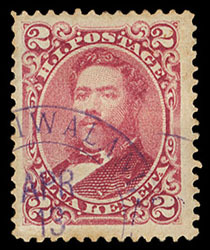 Hall, Hawaiian Mail Service, Dec 5, 1884, bold strike of purple cds (Davey 365, scarcity 2) cancels 1¢ green (42) horizontal pair, well centered, trivial perf flaw on right stamp, Very Fine and choice. Hawaii, U.S.F.S. Philadelphia., blue Flag Ship straightline handstamp on cover bearing 2¢ rose (81) tied by "Honolulu. 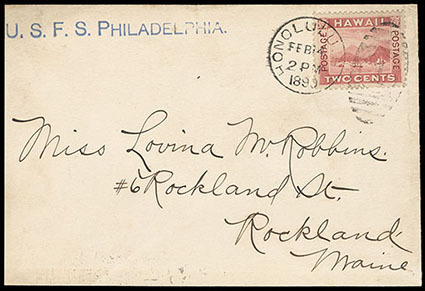 H.I., Feb 14, 1899" duplex to Rockland Me., reverse with partial San Francisco (2.23) transit and Rockland Me. (2.28) arrival cds; reduced on three sides, otherwise Very Fine and rare ship handstamp. The USS "Philadelphia" was recommissioned 9 July 1898 and became the flagship of Rear Admiral J. N. Miller, Commander-in-Chief of the Pacific Station. She steamed from San Francisco 2 July to participate in the ceremonies attending the assumption of sovereignty by the United States over the Hawaiian Islands. Flagship "Philadelphia" arrived Honolulu Aug. 3rd, and nine days hence her officers and those of the steam sloop Mohican, with a force under arms from the two warships, represented the US Navy at the ceremonies transferring the Hawaiian Islands to the United States. In March 1899, with Commander-in-Chief Rear Admiral Albert Kautz embarked, Philadelphia steamed to the Samoan Islands for duty in connection with the settlement of civil difficulties by the Samoan Commissioners of the United States, Great Britain, and Germany. A landing party from Philadelphia went ashore in the vicinity of Vailele 1 April to act in concert with a British landing party. The combined force, ambushed by adherents of Chief Mataafa, sustained seven killed and seven wounded, including two American officers, Lieutenant Philip Lansdale and Ensign John R. Monaghan, and two sailors killed, including Seaman Norman Edsall, and five bluejackets wounded. Philadelphia remained in the Samoan Islands until 21 May 1899, when she steamed for the west coast via Honolulu. Philadelphia served as flagship of the Pacific Station until 6 February 1900, when Rear Admiral Kautz transferred his flag to Iowa (BB-4). The cruiser continued Pacific operations until 1902, conducting training cruises, drills, target practice, and port visits.